This is a bundle full of multipurpose Instagram banners you can use to create all kinds of posts to promote your brand and products to your Instagram followers. The pack includes 80 different templates with fully editable designs you can customize using Photoshop. The stock images are also included with the bundle. With this Instagram banner toolkit, you’ll be able to create your own unique Instagram posts and banners. It comes with 28 fully customizable templates featuring smart object layers and editable vectors. This bundle is perfect for fashion brands and product promotions. A unique collection of Instagram banner templates designed specifically for product promotions. This bundle comes with 10 creative PSD templates that feature designs optimized for showcasing and promoting products to your Instagram followers. The templates can be easily customized with Photoshop. A must-have bundle of Instagram banner templates for restaurants, food trucks, and cafes. This pack comes with 9 unique Instagram templates for promoting food-related products and businesses. The templates are available in both PSD and AI file formats for easier customization. Create modern and elegant Instagram story posts using this pack of Instagram Story templates. It includes 12 unique Instagram story designs featuring easily customizable text and graphics. These are perfect for promoting fashion and apparel brands. A massive bundle full of Instagram post banners and story templates. This pack comes with 30 different Instagram Story templates and 30 banner templates. All templates feature free fonts and easily customizable designs with smart objects for image placement. This bundle of Instagram post templates is designed specifically for promoting online shops and products. It includes 20 unique templates featuring post designs for creating special discount promotion banners and sales banners. Another pack of 25 unique Instagram banner templates that feature modern post designs for creating banners for eCommerce businesses. The templates in this pack are most suitable for fashion and apparel brands and businesses. This is a collection of Instagram banner templates that come in 1080 x 1080 resolution. It includes 20 unique templates featuring free fonts and free creative common images. You can easily customize the template however you like using Photoshop as well. This bundle of Instagram templates comes with 24 multipurpose designs you can use to create banners and posts for all kinds of businesses and product promotions, including food, travel, and fashion related brands. It includes 16 banner templates and 8 Instagram story templates. This bundle of Instagram post templates comes with 10 unique banner designs that are perfect for promoting clothing and fashion related content. It includes several different styles of designs in high-resolution square layouts to quickly attract the attention of your audience. This Instagram template collection will allow you to easily design professional looking banners and posts to promote your brand and products on the social network. The pack includes 8 unique Instagram post templates in 800 x 800 px resolution. All the photos shown in the previews are included as well. A bundle of Instagram banner templates that comes with various styles of designs to suit different types of brands and businesses. This collection includes 10 stylish Instagram post designs you can use to share quotes, detailed information posts, and more. If you share a lot of travel photos or promote travel related products on Instagram, this bundle of Instagram story templates will help you get the attention of your audience. The pack comes with 10 unique and minimalist Instagram Story templates in 1080 x 1920 resolution. This pack of Instagram post templates features various styles of geometric shapes and designs to help you add a unique touch to your Instagram feed. The bundle includes 7 unique templates in PSD format. You can easily edit and customize the colors to your preference. A big bundle of 22 Instagram post templates featuring various modern designs and styles. The templates in this pack come in 2048 x 2048 px resolution PSD files featuring smart objects to let you easily replace the graphics with your own images. This is a collection of Instagram story templates that comes with elegant designs made specifically for promoting clothing and fashion brands. The pack includes 10 unique PSD templates with customizable designs. This multipurpose social media templates bundle comes in both square and portrait banner sizes for promoting your business and brand on Instagram, Twitter, and Pinterest. It includes 12 unique templates and you can edit them using either Photoshop or Illustrator as well. This is a bundle of high-quality Instagram post templates that are specially designed for promoting fashion and clothing related brands. It features 10 templates with attractive designs and easy to edit smart layered PSD files. Instagram is a great platform for promoting travel related services and products. This is a pack full of 40 templates designed just for promoting travel related posts. You can easily edit and customize the templates to fit your brand and promotions as well. Instagram stories is the new feature that allows you to actively promote posts to your followers. The templates in this bundle are designed to help you create beautiful Instagram Stories instantly while also promoting your products. Whether you’re promoting a clothing line, handbags, watches, or any other product related to fashion, this pack of templates will come in handy. It features 15 unique Instagram post templates that you can easily edit and use for your promotions. A pack of miscellaneous Instagram post and banner templates. It comes with 40 templates with many different types of styles and designs. You can use this pack to promote almost any type of a brand or business. The photo-based social network is great for promoting gym and fitness programs. Use this Instagram banner templates to get more attention for your business. This pack features 10 unique and fully-editable templates in PSD files. Another pack of Instagram stories templates that feature a modern and a minimalist design. This bundle includes 12 unique templates you can use to create posts related to fashion, eCommerce, blogs, magazines, and more. This is a bundle of 12 professionally designed Instagram banner templates that come in fully customizable PSD files. You can easily edit these templates and use them to promote your brand on Instagram with high-quality banners. This pack of Instagram story templates features a unique design inspired by nature and botany. It’s ideal for promoting any nature related or botanical gardens on Instagram. Of course, it will also work for other types of businesses as well. Looking to generate more sales for your online store through Instagram? Then use these templates to create attractive posts to grab the attention of your followers. This pack of Instagram banner templates includes 20 PSD files with various designs for promoting eCommerce businesses. A pack of Instagram story templates made specifically for travel-related businesses. This pack includes 10 unique templates featuring different styles of designs you can use to create beautiful Instagram stories. If you’re working on promoting a non-profit organization or a charity event, the templates in this pack will come in handy. These templates are specially designed for creating charity related posts for Instagram. Create unique Instagram stories for your online shop using this templates pack. It includes 10 stylish Instagram story templates that can be easily customized to your preference. From creating Instagram posts for travel bloggers to fashion stores, this bundle can handle all types of Instagram banners. It features 24 unique post templates featuring different designs you can use to create different types of Instagram posts and promotions. A pack of 30 unique Instagram banner templates featuring different types of designs. These templates can be used to promote all kinds of businesses and promotional events from hotels, restaurants, clothing stores, blogs, magazines, and more. If you’re planning to promote a DJ event, dance, or karaoke event on Instagram, you can use these templates to easily create professional looking Instagram posts in a few minutes. The pack includes 10 different templates you can use to create posts for 10 days. This is a unique collection of Instagram banner templates that features a design that makes your posts look like they were from a news broadcast. The unique design will definitely help your brand grab some attention from your followers. 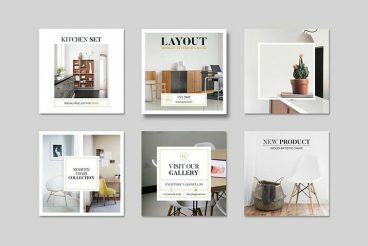 If you’re promoting a furniture store or a similar product like a standing desk, this template pack will be quite useful to you. It comes with 16 different Instagram post templates you can use to create minimalist and inspiring posts. A pack of clean and minimal Instagram banner templates that includes 6 PSD files. You can easily edit and customize the PSDs to use your own content and create stylish banners for your Instagram feed. If you’re planning to launch a mega sale or a discount promotion for your eCommerce business or online store, use these templates to promote the sale on Instagram. These professionally designed templates will help you instantly attract more followers and generate more sales. Another bundle of 20 unique Instagram banner templates specifically made for promoting fashion and clothing related businesses. You can also easily edit the text, shapes, and colors of the templates as well. Don’t let Starbucks dominate social media with their stylish Instagram posts. Create your own unique posts to get more attention on Instagram with this set of banner templates. These templates are designed just for creating posts for coffee brands and coffee shops. Plan your next Black Friday sale with this pack of Instagram templates. Although, the design of these templates seem to be using the event name quite literally since templates use a quite dark design. It includes 6 different templates, which you can easily edit to change colors and customize. This bundle includes 12 unique Instagram templates you can use for different types of promotional events and sales for fashion-related businesses, clothing brands, online stores, and more. Promote your healthy food and lifestyle brands on Instagram using this bundle of banner templates. It comes with 10 unique templates that feature a professional and a modern design. Create unique banners and posters to promote your seasonal offers and campaigns using these templates. This pack includes 20 different Christmas themed templates you can use to create unique posts. This is a pack of unique and minimal social media post templates which includes templates with 10 different designs that you can use to create posts for Instagram, Twitter, Facebook, and even Pinterest. There’s nothing sweeter than a cupcake. Show the world the delicious side of your cupcake businesses using these Instagram post templates. It includes 10 templates with gorgeous designs that will help you highlight your cupcake promotions. Another pack of templates designed for promoting a furniture store. These Instagram banner templates are ideal for creating posts to promote your special store discounts and sales. This bundle features a set of 25 unique multipurpose social media templates for promoting different types of businesses. It also includes templates in both square and horizontal formats, which you can use to create both Instagram and Facebook posts. This mega pack comes with 100 different post templates you can use to create different types of square, vertical, and horizontal posts for Instagram, Twitter, Pinterest, and Facebook. All are available in fully-layered PSD files. Create a 120-day Instagram content plan using this massive pack of banner templates. It has all kinds of Instagram banner and post templates you can use to promote different kinds of businesses and products. Check out more templates in our wedding invitations templates and logo design template collections.